The National Nutrition Conference is organised by the Bulgarian Society of Nutrition and Dietetics, and it is the biggest academic conference in Bulgaria in the field of nutrition. 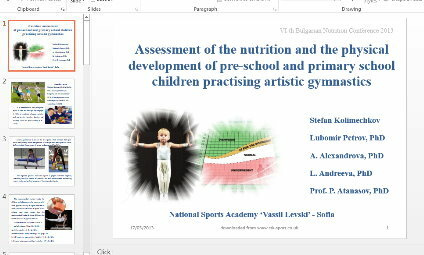 Dr Petrov and Dr Alexandrova represented us at this Conference, and unveiled findings from my Master's degree thesis on nutrition of pre-school and primary school children practising artistic gymnasts. Our abstract, as well as our presentation are both available for download on this page. After the Conference, the study was built upon further and the complete findings were published in the African Journal for Physical Activity and Health Sciences, Vol.22, 2016. 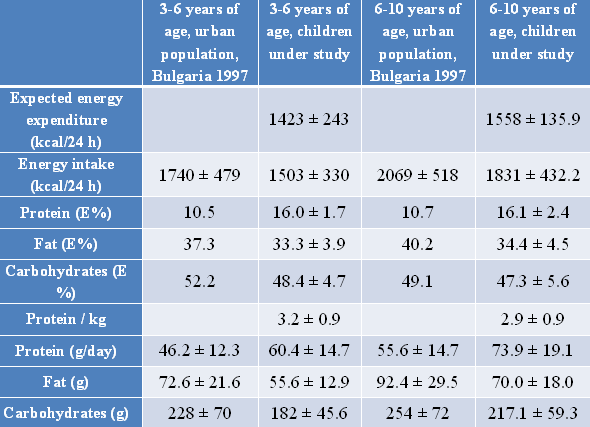 According to the National Centre of Public Health and Analysis (NCPHA) in Bulgaria, 200 000 children (or 20 % of the population) were overweight, of whom 65 000 were obese, in 2008. It is recommended that youngsters spend at least one hour per day engaged in light to moderate physical activity, such as jogging, jumping, dancing and different kinds of sport (Booth et al., 2005). Artistic gymnastics is one of the few sports which children from pre-school and primary school can practise. It develops those main qualities which define physical fitness: strength, speed, endurance and flexibility. 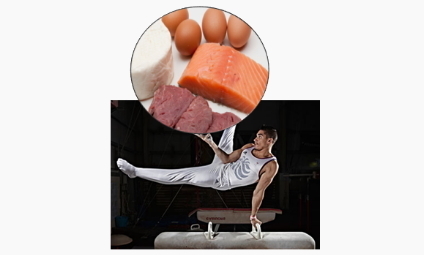 The repeated physical activities require a proper nutritional regimen, providing the right amount of proteins, fats and carbohydrates, maintaining energy intake and optimal amounts of vitamins and minerals. The recommended nutrient intake for children and adolescents who are engaged in extra physical activity is higher than that in ones who are not involved in sports. Child athletes need more protein than the recommended intake for those children who are not involved in physical activity. - for postevent refueling (within 2-3 hours): 1.7 g carb/kg. The aim of this study was to assess, using accessible methods, the diet and the physical development of pre-school and young school children practising artistic gymnastics. The study included 40 children (22 boys and 18 girls) between the ages of 4 and 12 years, attending gymnastics classes (3 to 5 times per week) at the ‘Sports Centre Levski’ in the capital of Bulgaria - Sofia. They were divided into two groups: pre-school (3-6 years of age) and primary school (7-11 years of age). The standing height of the children was measured to the nearest 0.1 cm with a stadiometer, and their weight with an electronic scale to the nearest 50g. The body mass index (BMI) was also calculated, and in order to determine body composition and body fat percentage, we used the skinfold measurement test, which was carried out with a caliper (Lange Skinfold Caliper, Cambridge) to an accuracy of 1 mm. 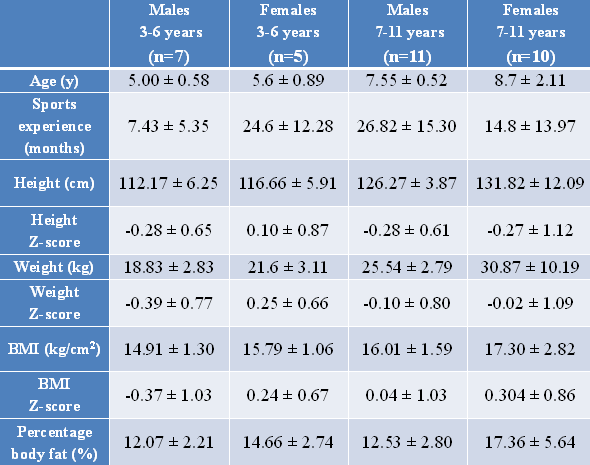 We used specialised software prepared by the World Health Organisation (WHO) – ‘WHO Anthro’ (for children under six years of age) and ‘WHO Anthro Plus’ (for children over 6 years of age), to assess height, weight and BMI in children. 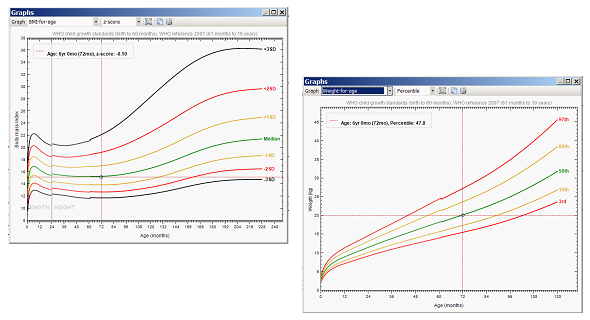 For each variable we calculated the Z-score and percentile score for the relevant age. 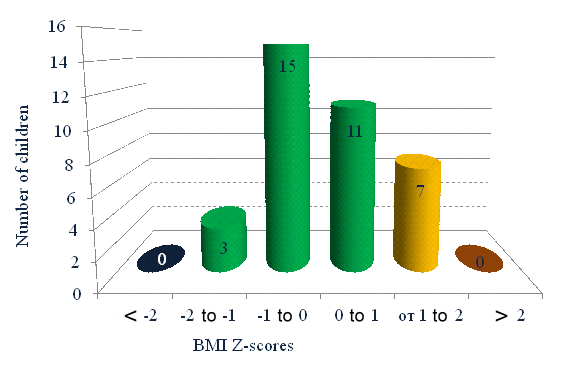 To distinguish the BMI scores, we used references provided by the WHO for children from 5 to 19 years of age. 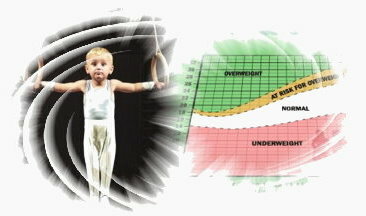 For percentile score : 85-95 percentile – overweight and >95 percentile – obese. 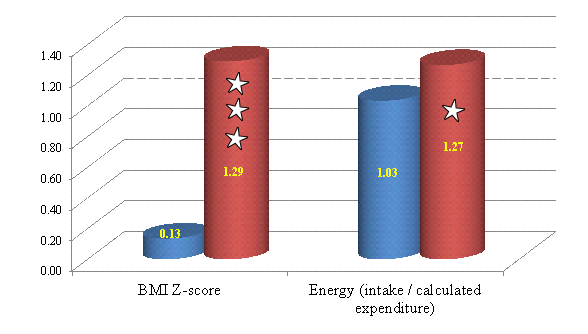 The basal metabolic rate (kcal/24h) was calculated using the formulae of Harris-Benedict. The estimated daily energy expended (kcal/24h) was derived by employing the basal metabolic rate (BMR) coefficient for physical activity, for which we adopted a figure of 1.4 for children practising 3 times per week, and 1.6 for children practising 6 times a week. 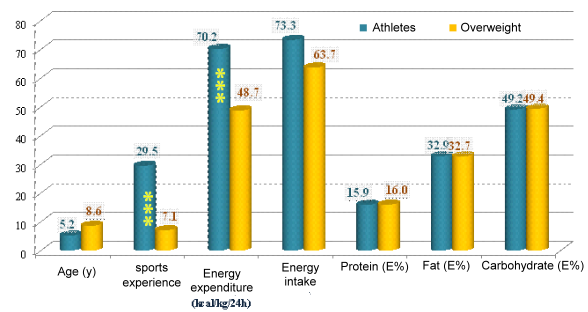 The nutrition questionnaire which had been used for adult athletes (Zaikova 2010, 2011, 2012) was adapted for our purposes in order to assess the nutrient intake in children. The Food Frequency Questionnaire (FFQ) was completed by the children’s parents. It included 24 questions relating to the weekly consumption of basic foodstuffs. Based on the results, the daily intake of proteins, carbohydrates and fats, protein/kg body weight, in addition to the total daily energy intake (kcal/24h) was calculated. 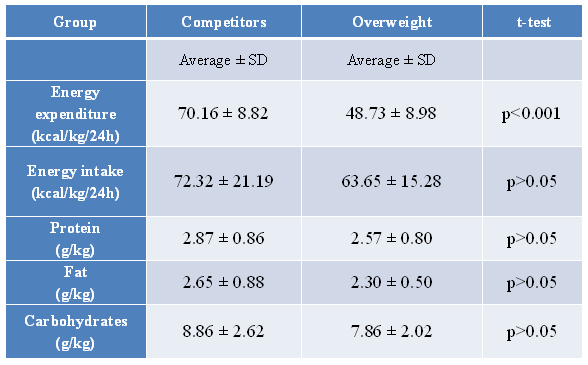 Energy expenditure and energy intake; protein, fat and carbohydrate / kg body weight (Average ± SE) in the overweight children (n=5) and children who were competitors (n=12). The volume of aerobic exercise in the preparatory part of the gymnastics session should be increased, in addition to various games and different athletic exercises which might be included. Foods with high energy content (bakery products, chocolate, candy, etc.) should be minimized, and those of fruits and vegetables maximized. Children should be stimulated to eat more healthily. 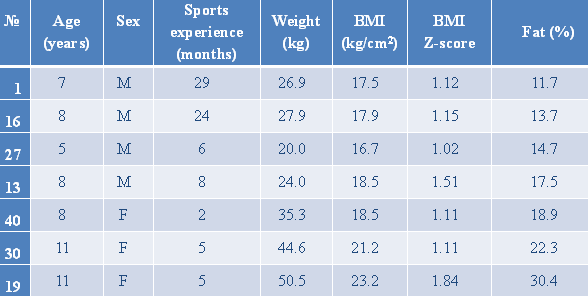 BMI is not an adequate indicator for child athletes with greater muscle mass. In these cases, more anthropometric data (% fat, skin folds) should be taken, as well as strength indicators (data for muscle hypertrophy and dynamometers). The nutrition questionnaire which was used gives a good indication of the average intake of the main food groups, nutrients and energy. This conclusion is confirmed by the close accordance between the data obtained in our study and that from others which have been conducted. Information about extra physical activities, which is not part of the PE lessons or sports training, should be collected in order to assess correctly the energy expenditure in child athletes. The amount of aerobic exercise in training sessions should be increased for overweight children, and a healthy way of eating should be promoted for them and their parents. This scientific presentation is also available in Bulgarian language (on PDF file, on PPTX file), as well as the full program (.pdf file) of the Bulgarian Nutrition Conference 2013. Kolimechkov, S.T., Petrov, L.A., Alexandrova, A.V. & Atanasov, P.S. (2016). 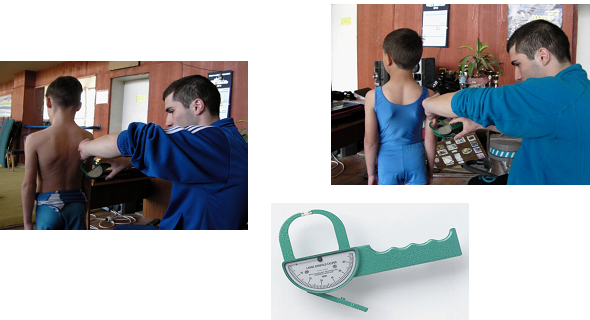 Nutrition and physical development assessment of pre-school and primary school children practising artistic gymnastics. African Journal for Physical Activity and Health Sciences, 22(2:2), 565-577. 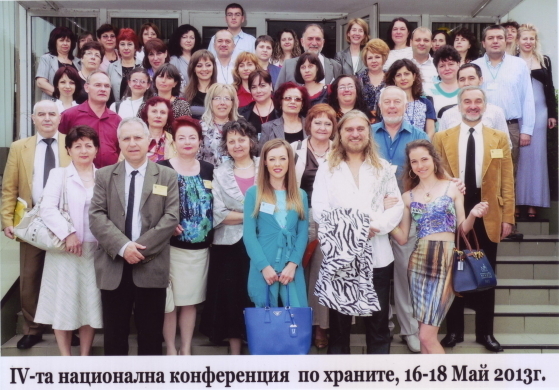 We were represented by Dr Petrov and Dr Alexandrova (on the photo above with all other participants in this scientific conference).